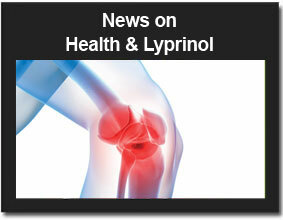 Lyprinol® is a safe, effective natural anti-inflammatory trusted and used successfully thousands of people worldwide. It is a unique blend of Omega 3 polyunsaturated fatty acids extracted from New Zealand Green Lipped Mussel (Perna Canaliculus). Lyprinol is the only formulation containing green lipped mussel oil supported by clinical and laboratory studies published in peer-reviewed medical and scientific journals. No other green lipped mussel extract is backed by such research. DOES LYPRINOL® HAVE ANY NEGATIVE EFFECTS? Lyprinol® has no known negative side effects. HOW LONG DOES IT TAKE TO FEEL THE EFFECTS OF LYPRINOL® ON MY BODY? For most people it takes a few weeks to notice the effects of Lyprinol® on their body. Some say they felt better in just a few days, while others report that it took 4-6 weeks before they could feel the difference. Regardless of whether it takes weeks or days for you to experience the wonders of Lyprinol®, one thing is for sure: It will only work if you take it on a regular daily basis. In very rare instances, some have reported an increase in their symptoms including pain in the initial dosing period. If this happens, all that is needed is to reduce the amount of capsules being taken until they feel more comfortable and then slowly increase the dose after 4 weeks. Most people who have experienced this problem end up having a much better result than the others. WILL LYPRINOL® INTERFERE WITH OTHER MEDICATIONS? Lyprinol® is a nutraceutical product. This means that Lyprinol® is 100% all natural and can not hurt you, nor will it interfere with any other medications. 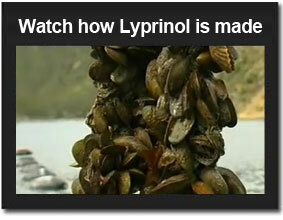 IS LYPRINOL® LIKE OTHER GLM (GREEN LIPPED MUSSEL) PRODUCT? No. The lipids in GLM are extremely sensitive to oxidation. Only Lyprinol® has a special patented stabilization mussel meat processing and oil extraction process which protect the active substance. WHAT ARE THE ADVANTAGES OF LYPRINOL® OVER GREEN LIPPED MUSSEL POWDERS? Mussel powders contain proteins, which can cause allergic reactions in some people. Since Lyprinol® is an oil, all the proteins have been removed. Lyprinol® is a potent concentrate, the dosage requirement is far lower and the soft gel capsules are easier to take. Mussel powders contain sea salt, which can be a problem for people needing to stay on a low salt diet. Lyprinol does not contain salt. IS LYPRINOL® APPROVED BY THE FDA (FOOD AND DRUG ADMINISTRATION)? Lyprinol® is not a drug nor is it medication. Lyprinol® is a 100% all-natural organic product thus it does not require the Food & Drug Administration’s approval. However, Lyprinol® does meet and conform to the Food & Drug Administration’s requirements for nutraceutical products. In Australia, Lyprinol® is listed with the Therapeutic Goods Administration (TGA), as a complimentary medicine for the relief of inflammation such as arthritis and gout. Likewise, it has been documented and evaluated for notification to health authorities in the European Union (EU) to enable a claim for dietary treatment of rheumatoid arthritis and arthritic joint diseases under the special category of Food Supplement for Supporting Medical Purposes (FSSMP). WHAT CAN LYPRINOL® BE TAKEN FOR? CAN A HEALTHY PERSON WITHOUT ANY INFLAMMATORY DISORDERS TAKE LYPRINOL®? Since Omega-3 fatty acids are essential for the human diet it should be taken daily even if you don’t initially suffer from inflammatory disorders. Children and your family pets can take Lyprinol® too. Omega Fatty acids have also shown to be effective for helping blood circulation, a healthy heart, and brain function. WHAT ARE OMEGA-3 & OMEGA-6 FATTY ACIDS? Two basic categories of PUFA’s (poly unsaturated fatty acids), which have received a lot of attention to human nutrition, are the Omega 6 and the Omega 3 PUFA’s. Omega 6 PUFA’s are contained in all vegetables oils. Some of Omega 6’s are considered more valuable, such as GLA (gamma linolenic acid, 18:3) found in evening primrose and borange oils. Omega 3’s are found to a limited degree in some plants but are contained in all fish and shellfish. For instance, canola and flax oils contain alpha linolenic acid (18:3). The Omega 3 PUFA’s contained in fish are considered to be five to ten times more powerful in their biological activities than those found in plants. IS THERE A DEFICIENCY OF OMEGA-3’S IN THE UNITED STATES? Many scientist and government institutions around the world agree that the average western diet is very high in another group of fatty acids, namely Omega 6’s. As a result our cell membranes are unusually rich in precursors associated with inflammatory processes, which can lead to arthritis, asthma, and psoriasis to name a few. The scientific research demonstrates proof that the American public needs to reduce omega-6s and increase omega-3s to improve their health. It actually has been proposed in the scientific literature to include in government policy to establish guidelines for these essential fatty acids. Research has shown Omega-3’s to be critical to joint, respiratory and cardiovascular health, normal cholesterol. HDL and triglyceride levels. The U.S. Food and Drug Administration (FDA) have now approved the use of the statement, “The scientific evidence about whether omega-3 fatty acids may reduce the risk of coronary hearth disease is suggestive, but not conclusive.” Omega 3’s help women during their menstrual cycle as well as support the brain. There actually have been over 5 studies that have shown that individuals who are depressed have lower blood levels of omega- 3’s than normal individuals. Omega-3’s support blood circulation in the body, the immune system, the gastrointestinal tract and the kidneys. WHY TAKE LYPRINOL® INSTEAD OF COD LIVER OIL OR SALMON OIL? Lyprinol® is a unique combination of 30 different fatty acids which are mixtures of saturated, monounsaturated and polyunsaturated fatty acids. The total of EPA (eicosapentaenoic acid) and DHA (docosahexaenoic acid) represents a total of only 20 % of the total fatty acids. The balance contains marine sterols and other fatty acids such as ETA and OTA. This combination acts as a potent anti Arachidonic Acid (AA) inhibitor (adipogenic effector). The potent AA inhibition is due to the affinity the Lyprinol® combination has on the inhibition of AA which is one of the main precursors to inflammatory disorders. This ‘affinity’ does not happen with large dosages of EPA and DHA. HOW MUCH OF EPA AND DHA ARE IN LYPRINOL? DOES LYPRINOL CONTAIN MORE OR LESS EPA THAN FISH OIL? DOES LYPRINOL CONTAIN HEAVY METALS? Lyprinol does not contain high quantities of EPA or DHA but has combination of over 30 different fatty acids combined molecularly different to all other omega 3’s known. This product is 100% naturally occurring and also hides is secret of efficacy extremely well. Our researchers have been working for many years trying to unlock the key to the products efficacy which still remains hidden. It is of our expert opinion that the products efficacy lies within the molecular bonds. There are no heavy metals in the product, these are left behind in the starting material during the extraction process. The process of inflammation is highly complex and is defined as the body’s reaction to physical, chemical or biological injury, which, in a normal healthy individual, results in the localization of the problem and regeneration or repair of the damaged tissue. The inflammatory process occurs as a natural immune response to infection or injury. Inflammation indicates the actions of the healing process, and is caused by the rapid increase of white blood cells (T-cells, B-cells etc), which are drawn to the injured or infected area in order to destroy the foreign cells. The symptoms of inflammation, warmth, redness, swelling and pain, are the direct results of this increased concentration of blood cells. Within a healthy individual this inflammatory process is managed and contained (i.e. the white blood cells automatically recognize when their task is complete). However, in cases of rheumatoid arthritis, the immune response becomes erratic, unrestrained, and as the white blood cells begin to target self-tissues, the inflammation becomes acute, and out of control. In certain circumstances, the process itself can cause damage and injury. A prime example is that of Osteo-arthritis, an inflammatory disease which can effect all the bone joints of the human body but primarily affects the “wear and tear” joints of the feet, knees, hands, hips, shoulders, elbows and back which have usually had the effects of many years of work and sometimes injury. The autoimmune disease, rheumatoid arthritis, where the body attacks itself, and the hypersensitive states leading to asthma and anaphylactic shock, are examples of uncontrolled inflammatory responses. Initiation and control of the inflammatory process is complex and governed by an array of biomolecular mechanisms. One important pro-inflammatory mechanism is closely associated with cell membrane bound arachidonic acid, which becomes converted into other compounds in the body, which are potent inflammation-supporting substances. When inflammation occurs, chemicals from the body’s white blood cells are released into the blood or affected tissues to protect your body from foreign substances. This release of chemicals increases the blood flow to the area of injury or infection, and may result in redness and warmth. Some of the chemicals cause a leak of fluid into the tissues, resulting in swelling. This protective process may stimulate nerves and cause pain. The increased number of cells and inflammatory substances within the joint cause: irritation, wearing down of cartilage (cushions at the end of bones), and swelling of the joint lining.